The coat of arms can be blazoned Azure, a lion rampant barry of eight Gules and Argent, crowned and armed Or, surrounded by eight mullets Argent. This can be interpreted as a blue field with a lion of eight horizontal red-and-white-stripes, with a gold crown and claws, with eight white/silver stars. Some people believe the stars represent eight historical divisions of the state. It was included in the Gesetz über die Hoheitszeichen (Law on the Regional Emblems) of 30 January 1991, which came into law retrospectively to 3 October 1990. The current law, Verordnung zur Ausführung des Gesetzes über die Hoheitszeichen des Landes prescribed its use, including banning use by third parties, use of the coat of arms on the seal and use of the arms on the State flag. The state of Thuringia was created in 1920 by uniting the seven Thuringian polities: Saxe-Weimar-Eisenach, Saxe-Meiningen, half of Saxe-Coburg and Gotha (where Saxe (Gotha) subsequently merged into Thuringia whereas Coburg merged into Bavaria), Saxe-Altenburg, Republic of Reuss (Reuss Elder Line, Reuss Younger Line), Schwarzburg-Sondershausen and Schwarzburg-Rudolstadt. 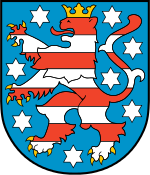 The northern part of today's Thuringia was part of Prussia (Erfurt governorate) and therefore not represented in this coat of arms. Inspired by the American flag (by featuring one star for each of its counties), the shield is gules, seven mullets of six points argent - seven six-pointed stars on a red background. It was used on the state flag of that period. The coat of arms was used until 1933, when the NSDAP government created a new coat of arms. The arms, used by Landgrave Conrad in the 13th century, were azure, a crowned lion rampant barry of eight argent and gules, crown and claws or. ^ a b "Thuringia (Germany) - Coat of arms". Flags of the World. 7 Oct 2001. Retrieved 2009-04-26. ^ a b State of Thuringia at Flags of the World Accessed 2009-05-16. Coat of arms of Hesse, which has a similar appearance. Origin of the coats of arms of German federal states.